The Nano Titanium™ line fuses advanced technology, elite design, and powerful performance to create a truly groundbreaking set of products. 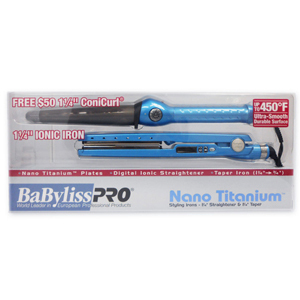 Utilizing nano technology and harnessing the high-heat conductivity of titanium, the dryers dry hair quicker and the irons straighten faster, with longer-lasting results. Sleek, soft metallic-toned Ryton® housings withstand ultra-high temperatures, and the well-balanced, ergonomic design ensures sustained comfort while styling. Nano Titanium always delivers style with substance.